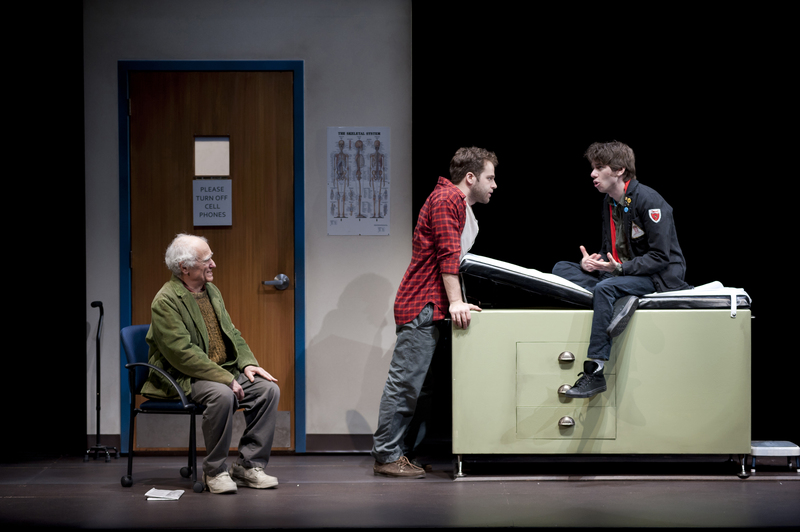 Yusef Bulos (Bill), Kelsey Kurz (Joseph), and Dan McCabe (Charles) in the Huntington Theatre Companyâs SONS OF THE PROPHET by Stephen Karam, directed by Peter DuBois. Playing 4/1/11 â 5/1/11 at the Calderwood Pavilion at the BCA. huntingtontheatre.org. Photo by Paul Marotta. Sons of the Prophet by Stephen Karam, Huntington Theatre Company, 4/1/11-5/1/11, http://www.huntingtontheatre.org/season/production.aspx?id=8754. “Happiness does not await us all. One needn’t be a prophet to say that there will be more grief and pain than serenity and money. That is why we must hang on to one another.” Anton Chekov qtd. by Stephen Karam in the program. If Roundabout Theatre Company and the Huntington Theatre Company takes Stephen Karam’s Sons of the Prophet to Broadway next year, in June 2012 we will likely hear, “and the Tony Award for best play goes to…Sons of the Prophet.” Taking the seemingly sombre subject of pain, Karam has written a comic masterpiece. Add to that the talented cast, direction, and set design and the result is a fast-paced night of laughter and poignancy that should not be missed.